The CBC Massey Lectures are fifty years old this year. 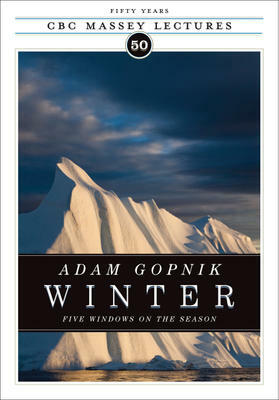 To celebrate them we have a fascinating book called “Winter” – a collection of five essays by the best-selling writer Adam Gopnik. He looks at the Romantic side, beloved by painters, poets, even musicians (and the book has some excellent illustrations); next the Radical winter, made famous by expeditions to both North and South poles by men whose names have become legendary because of their bravery. Gopnik looks at the making of the modern Christmas with some surprising adventures by Santa Claus. Another chapter covers Recreational winter, with fine bits on hockey, and finally Remembering Winter, showing winter stress making summer sweetness. Gopnik confesses winter is his favourite season. These essays provide a welcome lead-up to the year’s coming cold days. The lectures themselves are given in November, 20ll. Gopnik was born in Philadelphia but raised in Montreal, where he went to McGill University (and to the Forum to watch hockey). He has been a staff-writer at “The New Yorker” for twenty-five years and is the author of “Paris to the Moon” and other collections of essays, as well as novels.